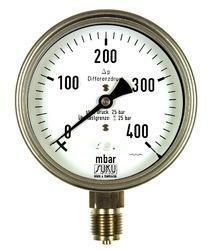 With enormous experience in this domain, we have established ourselves as a dependable supplier, distributor, wholesaler, trader, retailer of precisely designed Pressure Gauges. Our offered range is manufactured using superior quality raw materials and advanced technology at the vendor’s end. While manufacturing the offered range of products, we lay special emphasis on the overall quality and durability. Additionally, our quality analysts keep an eye on the entire range to avoid any possibility of flaw.